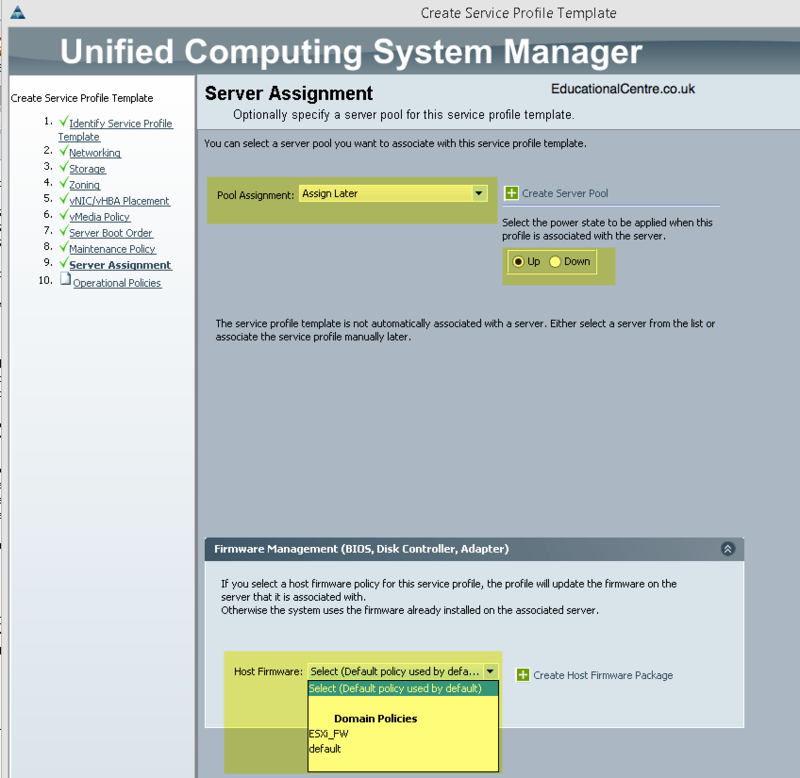 Log into your Cisco UCS Chassis. 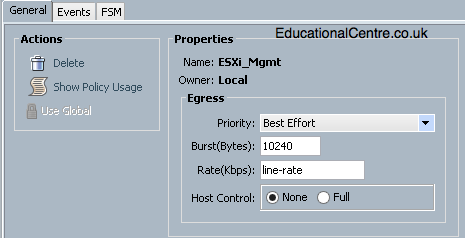 Ensure that ethernet mode is set to “End Host” (you can read more about the options here). 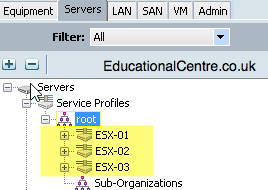 Click LAN on the top left tab, then Expand LAN > LAN Cloud. You will see your Fabric’s as well as other options. 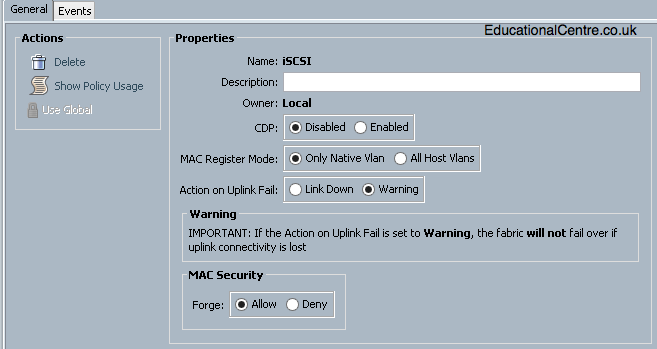 For my environment, we are using VLAN 1 (default), so a very uncomplex setup. 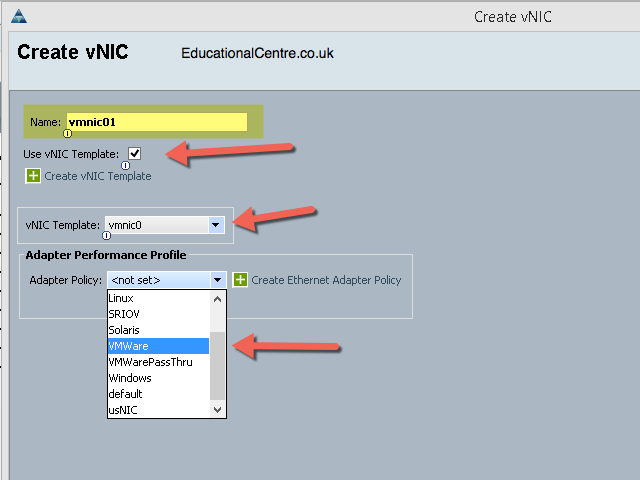 However you can assign VLAN’s from your external switches to be accessible into the blades here. 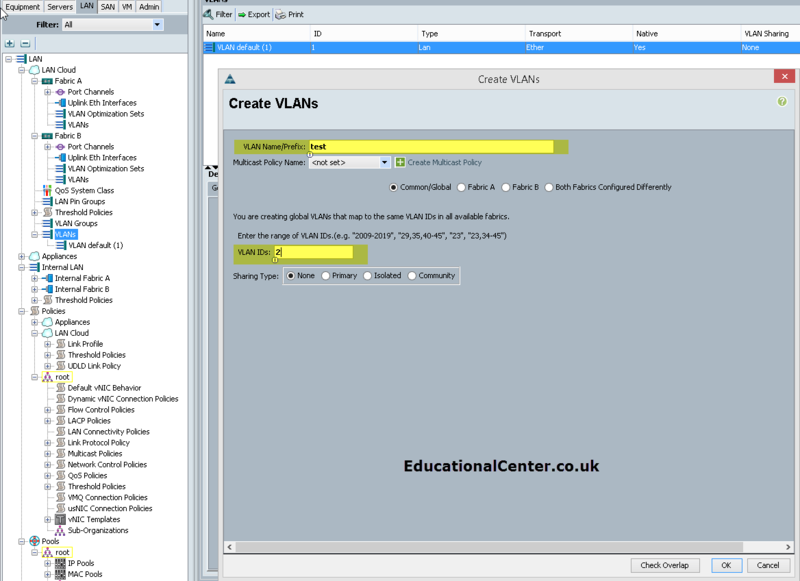 You are able to create VLAN’s that are shared across both Fabric Interconnects, or separate for both FIs. Below you can see the different options. 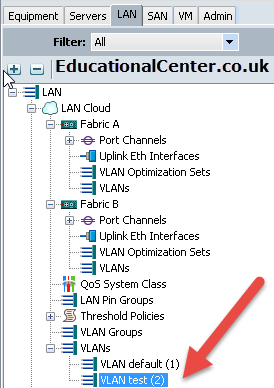 Above here, is where I’ve select for the VLAN to be present only on Fabric A, so you know see it appear under the Fabric Interconnect drop down. 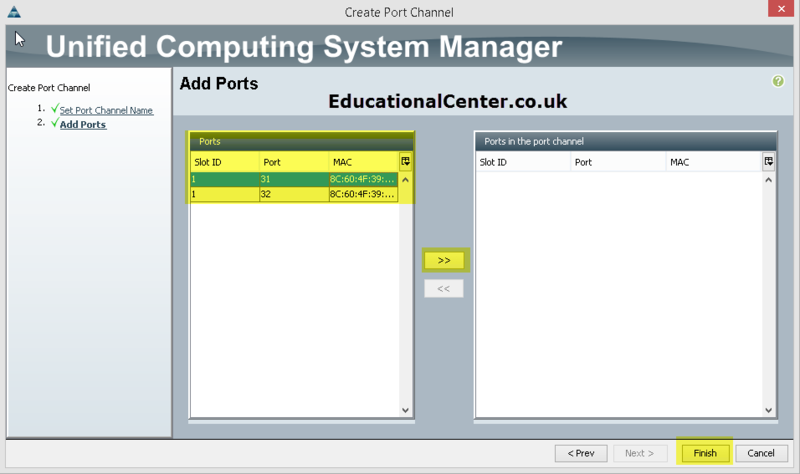 Setting up port channels is as simple as selecting the ports available (the ones you configured as LAN ports earlier). 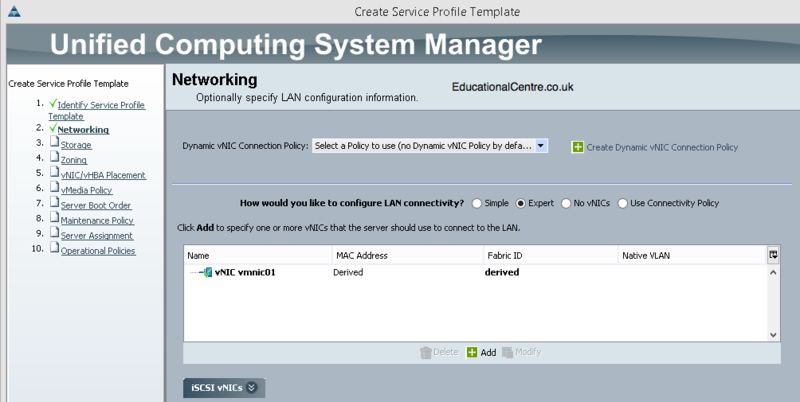 On your switch side, you need to configure the ports in LACP. 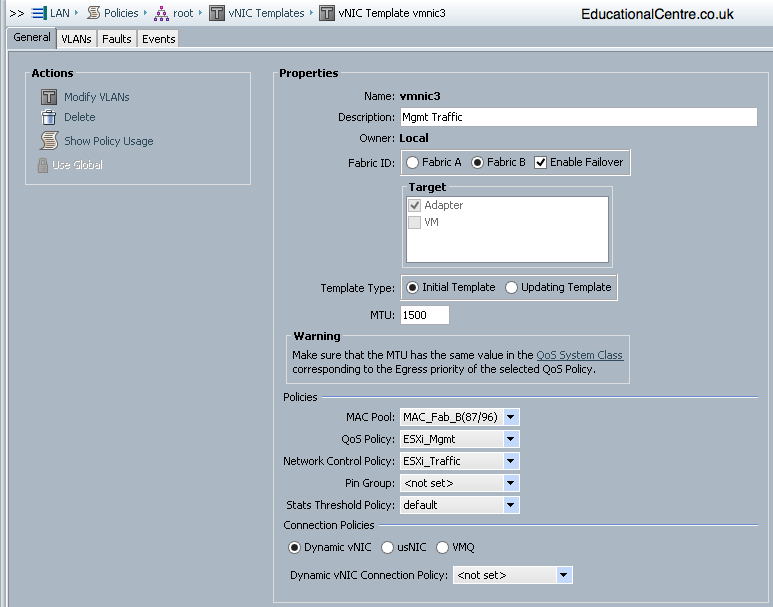 As the FIs are physically separate from one another, the Nimble SAN which I have used in this setup needs to have its Controller connected to both FI’s, these connections need to be on separate IP addressing schemes. 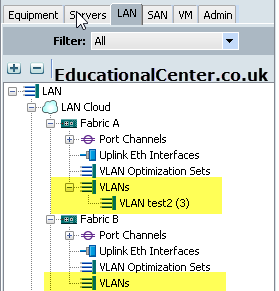 Therefore similar to above, I’ve setup a separate VLAN per FI. 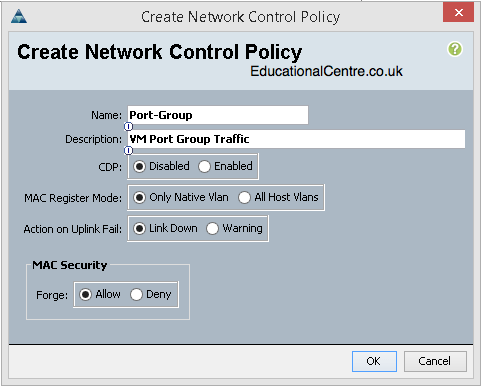 Expand each interface under the FIs and set them to be access ports and on the VLAN you have created. 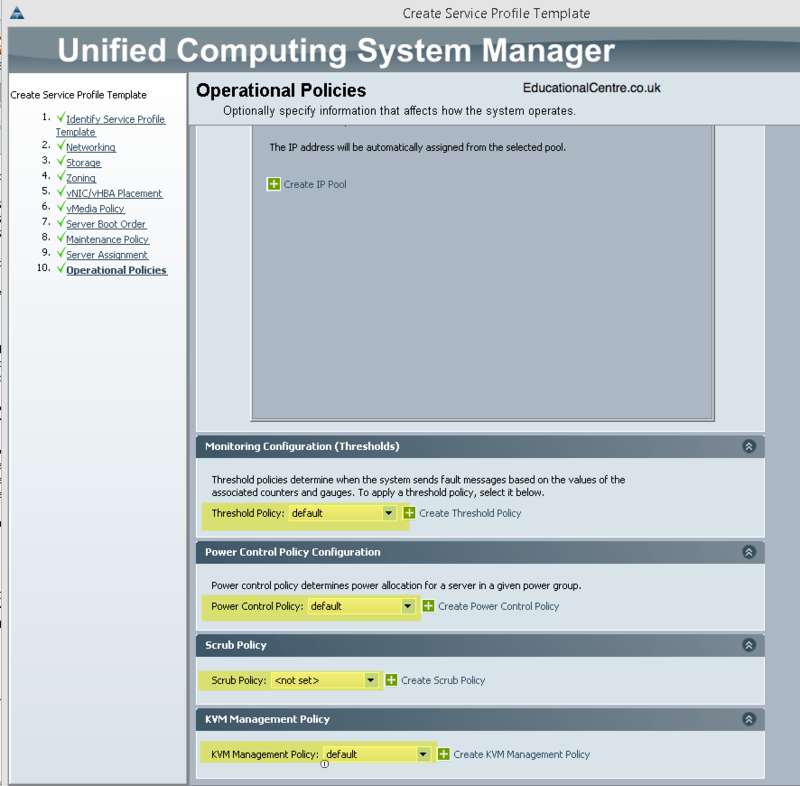 The settings implemented for this environment are from the best practice guide when setting up a Nimble device with Cisco UCS. 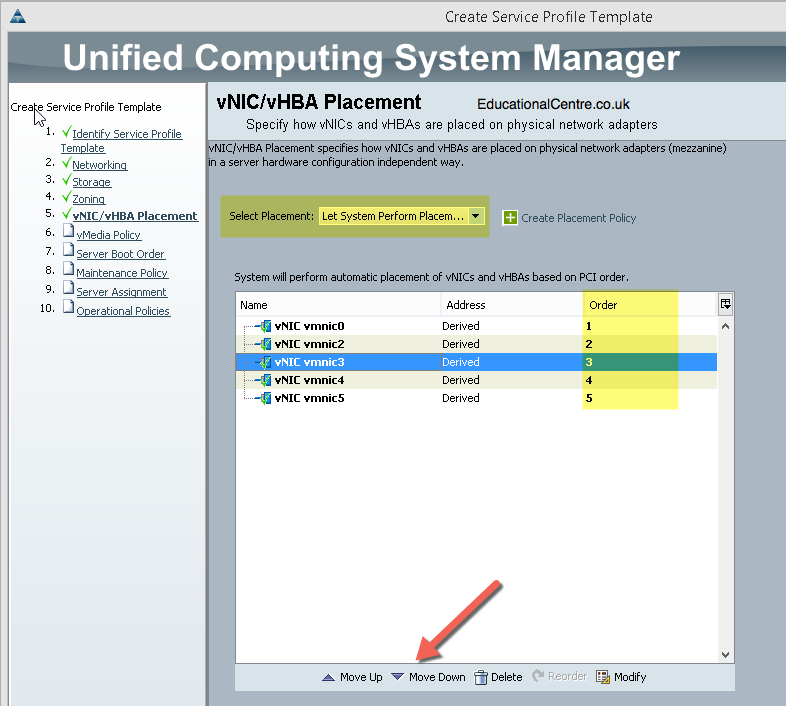 You can simply select these settings on each interface under the appliance heading. 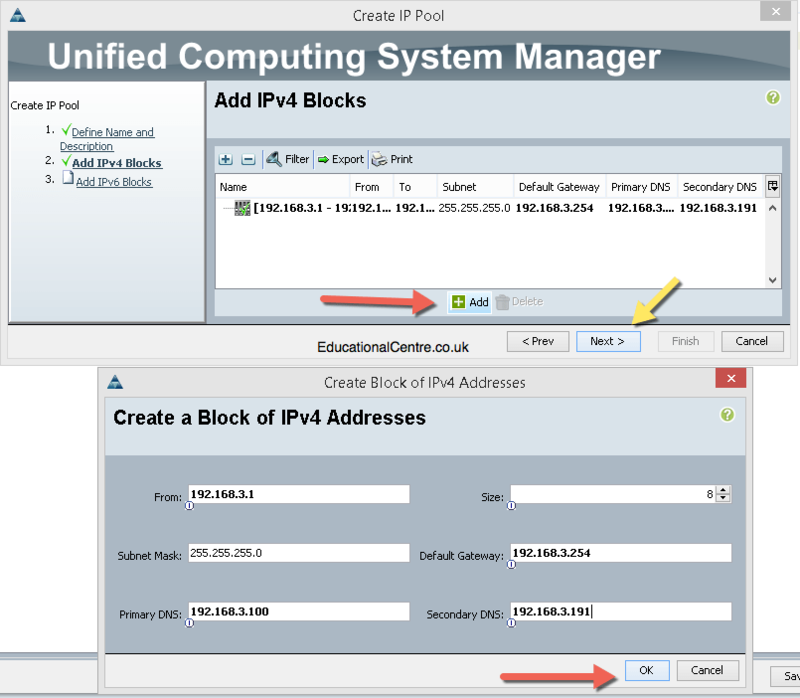 Go to the bottom under Pools > Root > IP Pools. 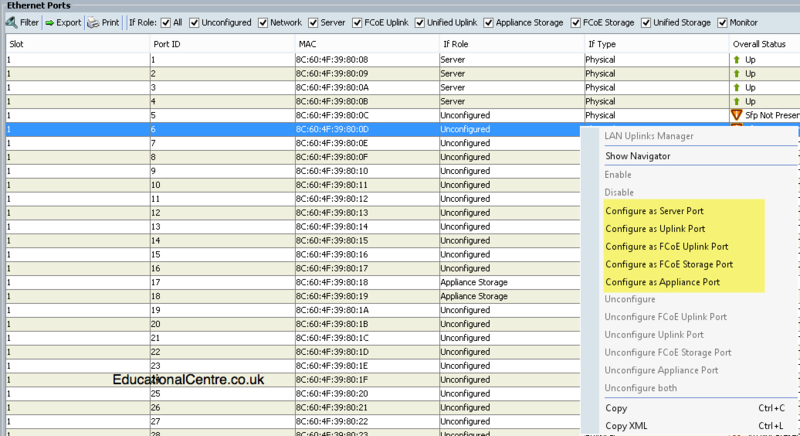 Looking in the main window, you can see a summary of the IP addresses available and assigned. And by selecting individual pools, you can see how these are assigned. Below in the second screenshot, you can see a gap in the middle of the pool, this is due to selecting default assignment order. 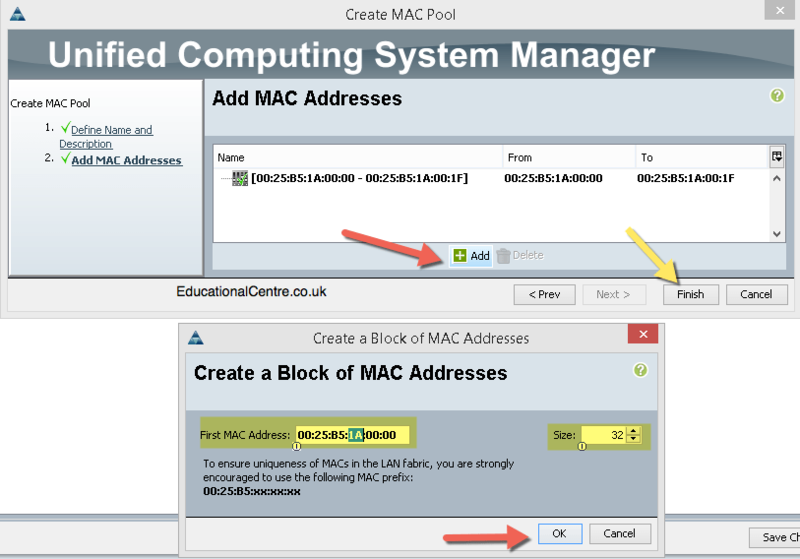 Next we need to configure MAC Address pools for any virtual network card added to the blade servers. You will more than likely opt to have adapter pairs, one adapter per fabric interconnect. 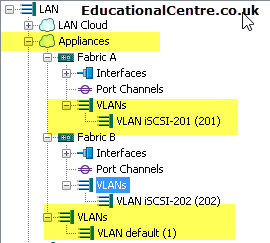 So it’s considered best practise to give yourself a way of identifying which adapter is linked to which fabric interconnect. 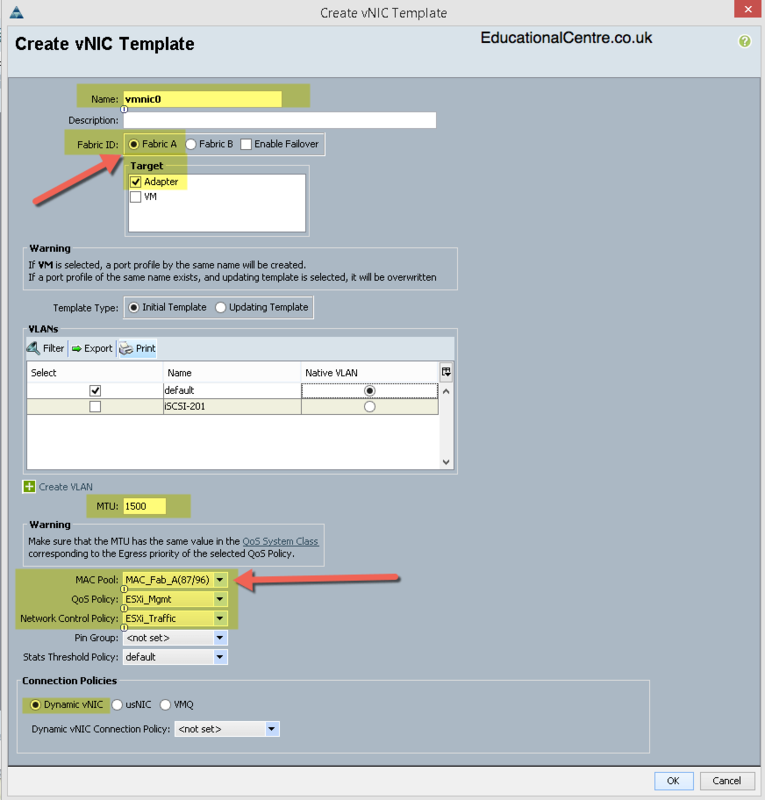 When setting up the VNIC templates, you’ll choose which Fabric they connect to and which MAC pool they get their address from. 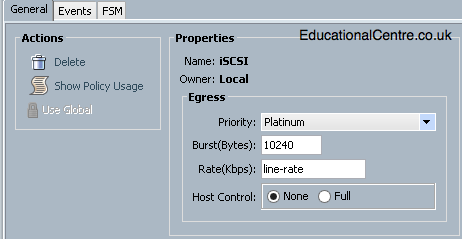 Now for the QoS Settings, these for me, were setup according to the best practices for using iSCSI Nimble configuration in the environment. 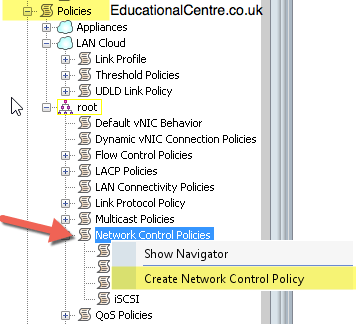 Finally lets create some Network Control Policies to be used for each type of traffic as well. 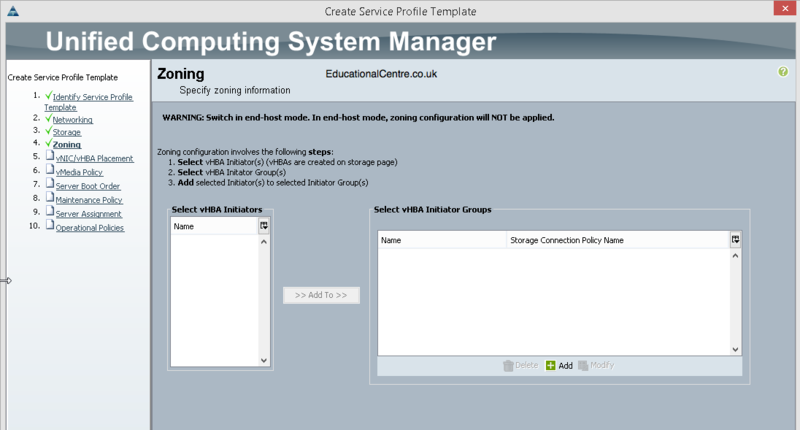 Here we are setting up the basis structure of the virtual NICs that will be added to each blade server. 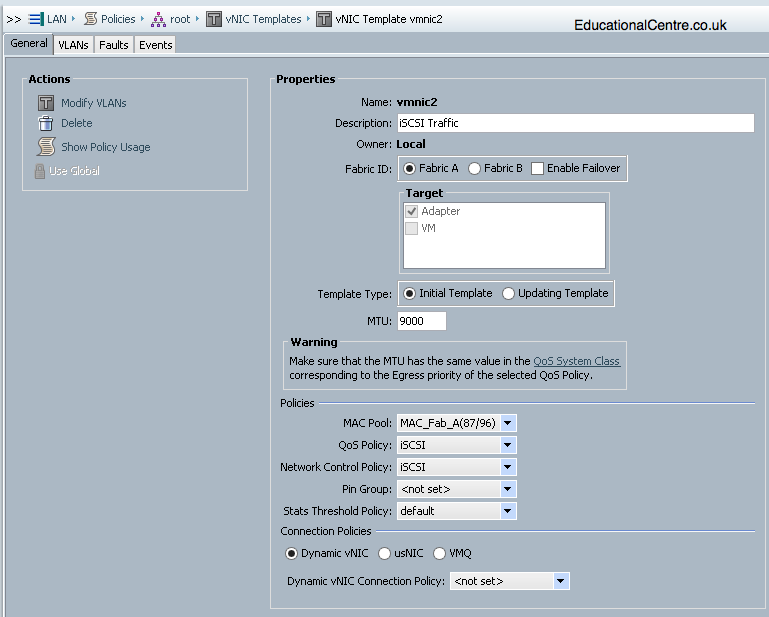 As this is going to be a VMware environment, I have named my templates similar to what I expect to see within VMware. 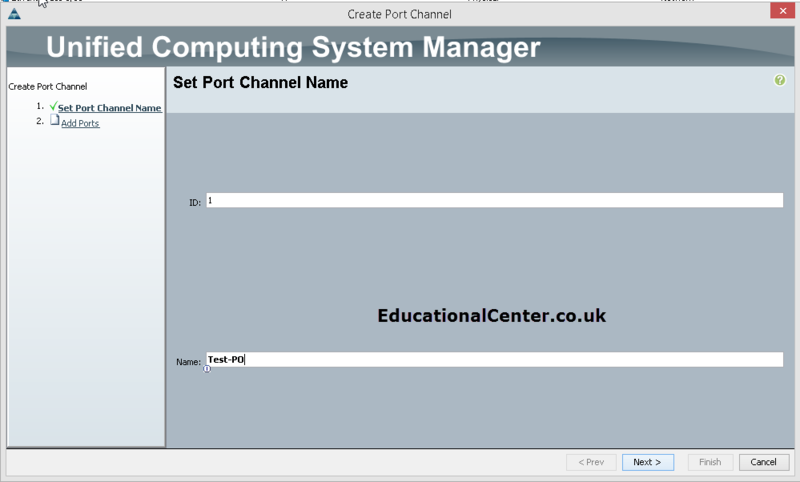 If you were configuring for Windows hosts, then you may opt for a method that supports your configuration better. 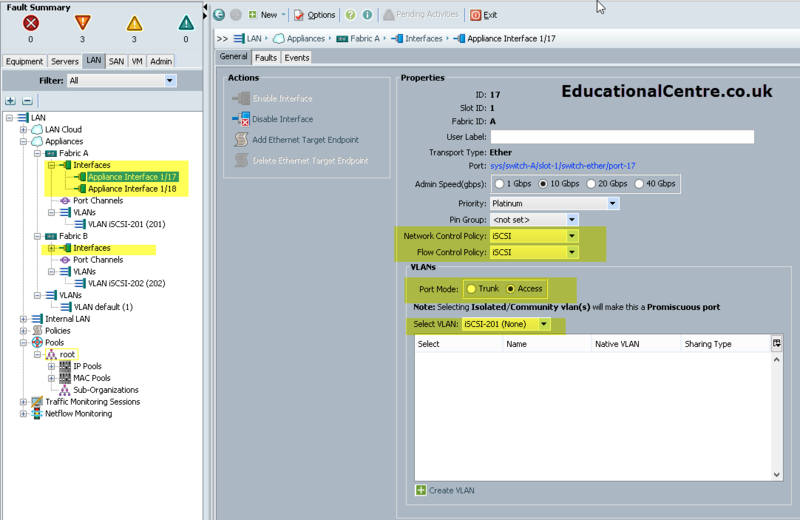 For this VMware based environment, I created 6 vmnics, 3 per Fabric Interconnect. Kind of mimicking what you’d expect in a rack mount server. 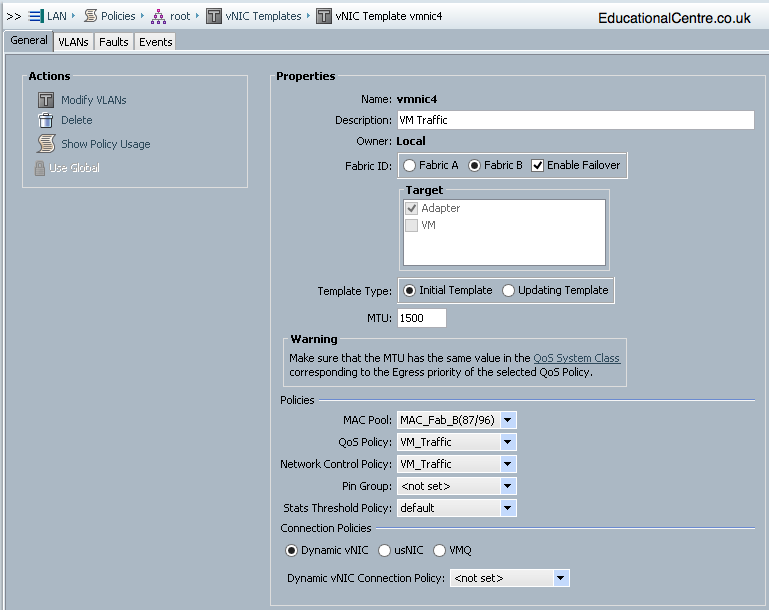 In the below example, it’s my first vmnic, so I’m going to be using that as management, this is set to only use Fabric A, therefore the MAC address pool is the one I’ve created for using Fabric A, as mentioned earlier in this post. 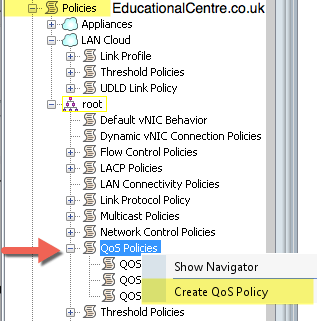 The MTU size set here needs to match the MTU size in the QoS Policy selected. Below are the screenshots of each. 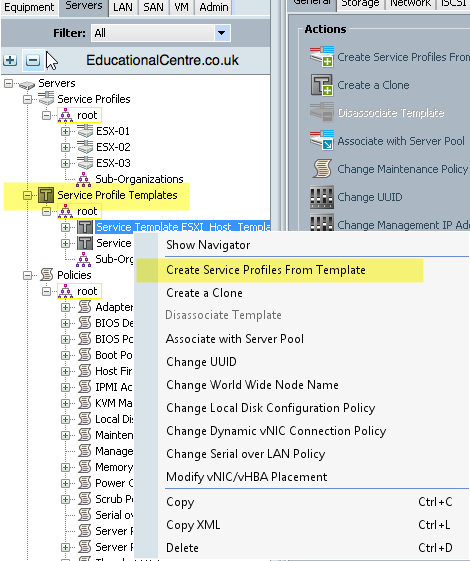 Head over to the Server Tab on the left hand side, and first we need to set up the policies that will be selected in the Server Profile Template. 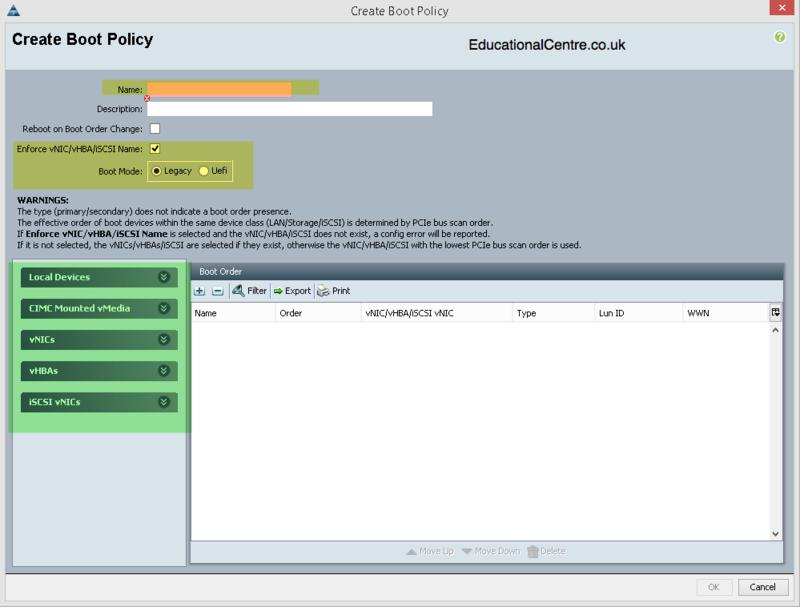 Create a Boot Order Policy, in my environment, we will be booting from SD Cards, but I’ve added CD devices as well to make life easier when building the hosts. 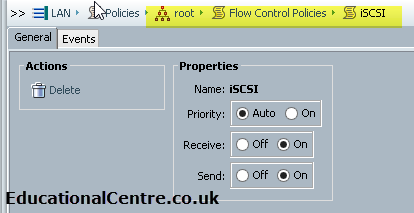 Create a Host Firmware Package, here I’ve selected the simple option and using the latest firmware available on the system. 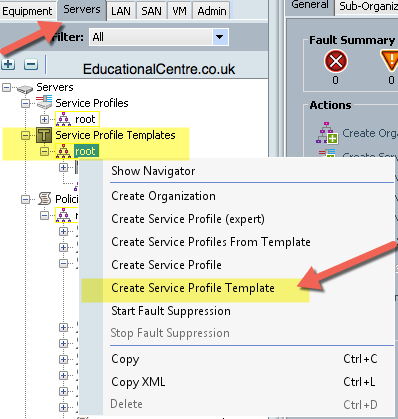 Create a Maintenance Policy, this is important and not to be missed out, as it controls what should happen when you make changes to a blade/rack server. 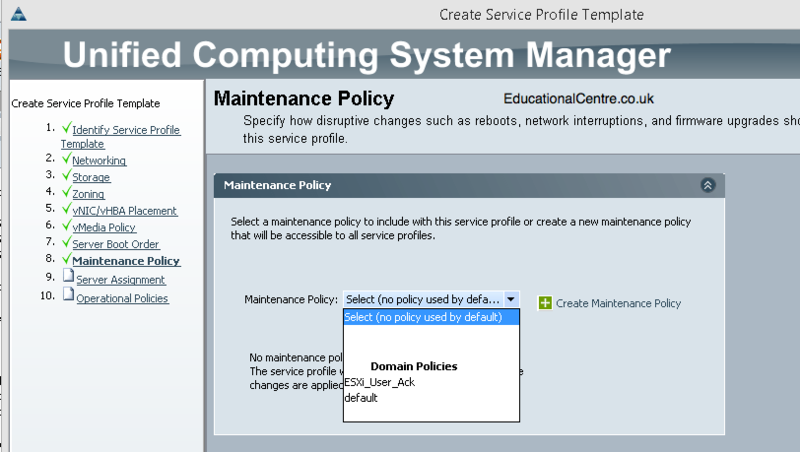 Basically with this setting a user should acknowledge any changes and therefore reboots needed. 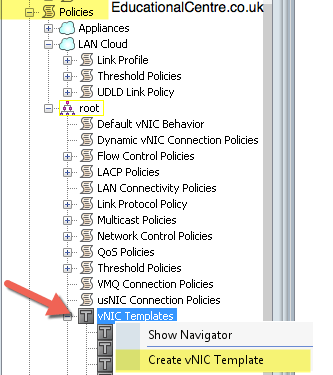 A separate dialog box will appear for the network adapter, I have selected to use the template I created earlier, but you can notice if you do not select this option, then all the setting available as the same as those in the template. 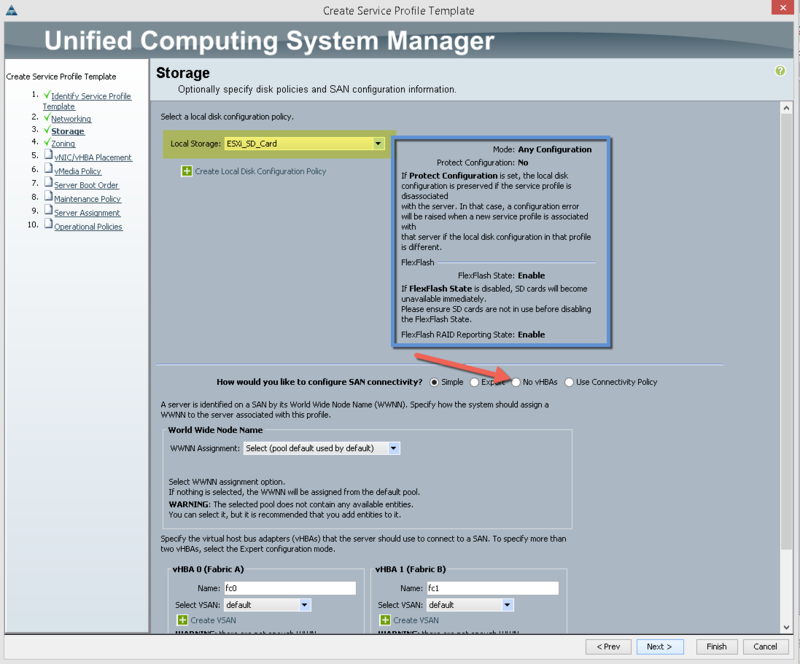 Note: If you are looking to configure Fibre Channel, please see this blog post. 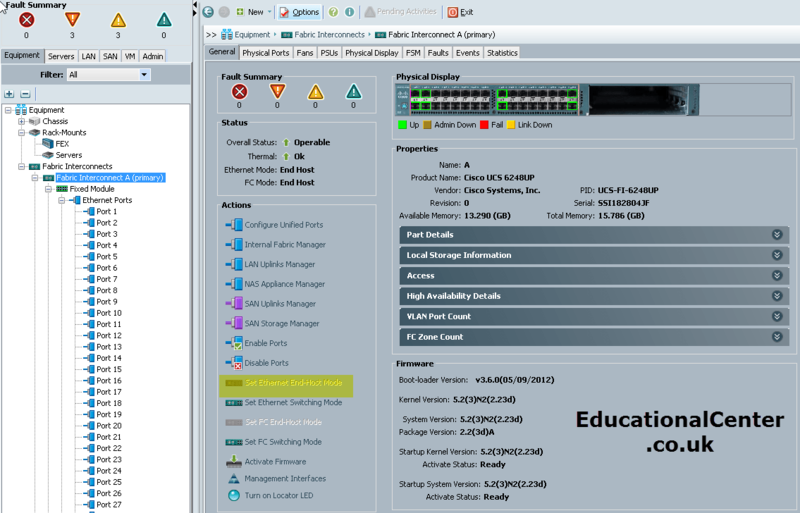 There will be no Zoning to configure, as there is no Fibre Channel in use. So just click next. 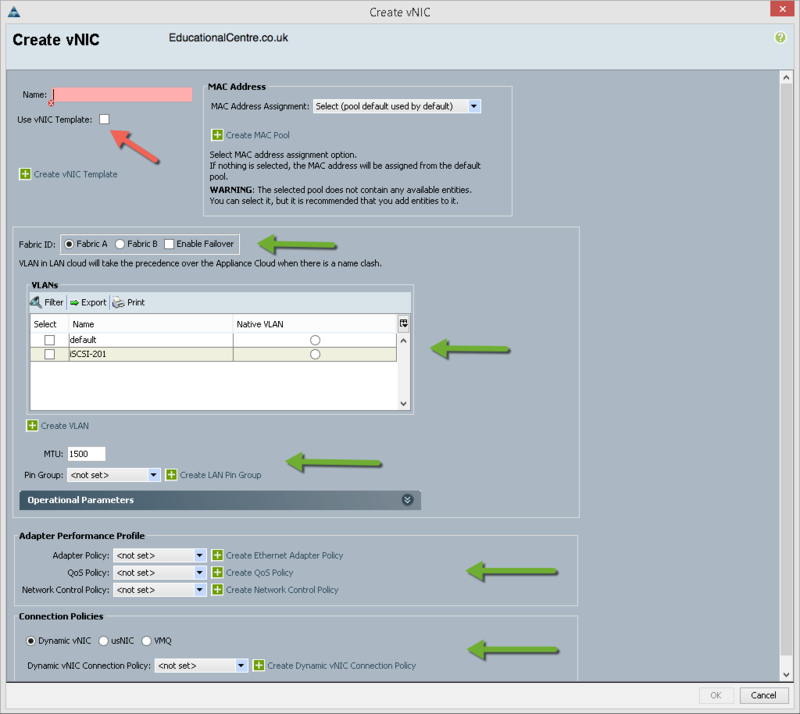 Next up, you can configure the VNIC order as they will appear within the server OS, so you can correct any placement needed. 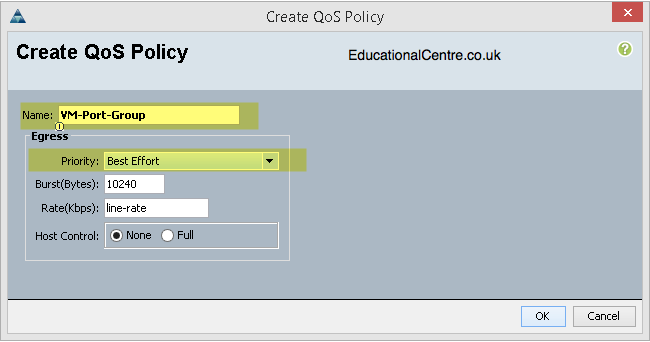 I havent created a virtual media policy, as the only configurable option is for encrypting the media communication. But you can set it here if needed. 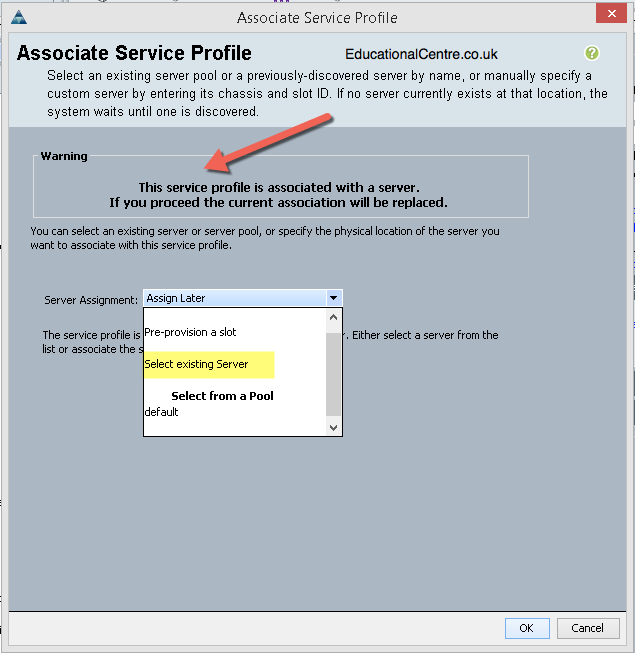 Select the server pool, I have left this to assign later, to allow for granular control of which servers will have this profile applied. 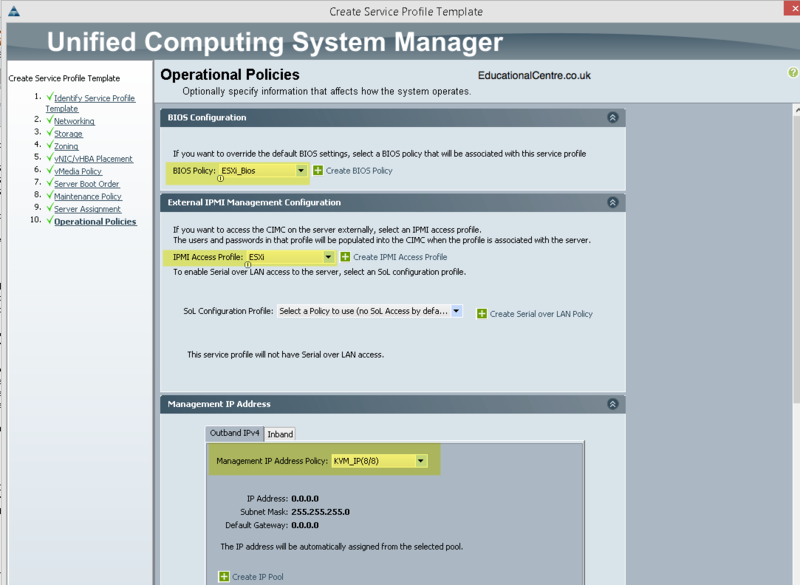 Also you set the firmware policy here as well. 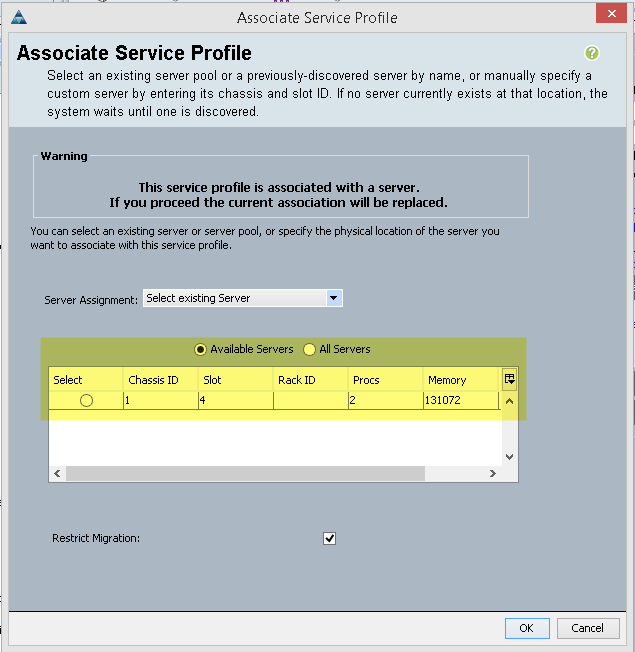 We now need to deploy the actual Service Profile, which will then be assigned to a set number of servers to give them their “personality”. 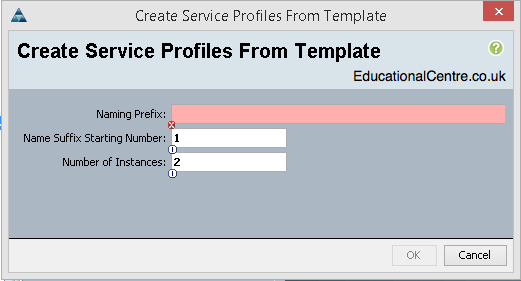 These Service Profiles will all have the same settings as the template, but then can be changed individually as needed. 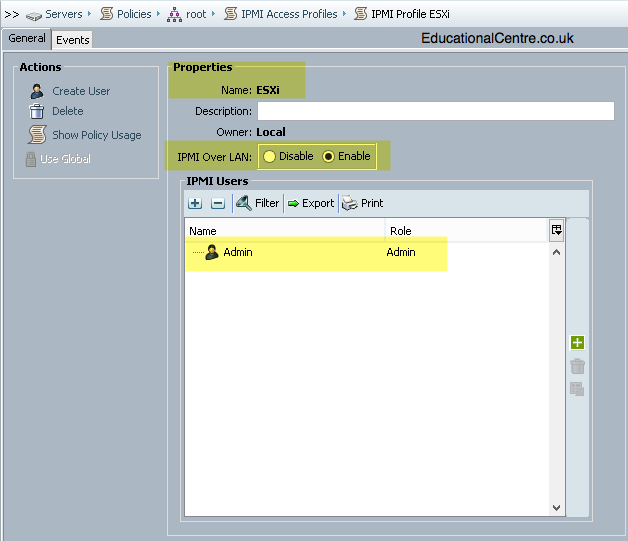 There is nothing stopping you from creating all your Service Profiles from scratch, but this can lead to human error and lack of consistency. 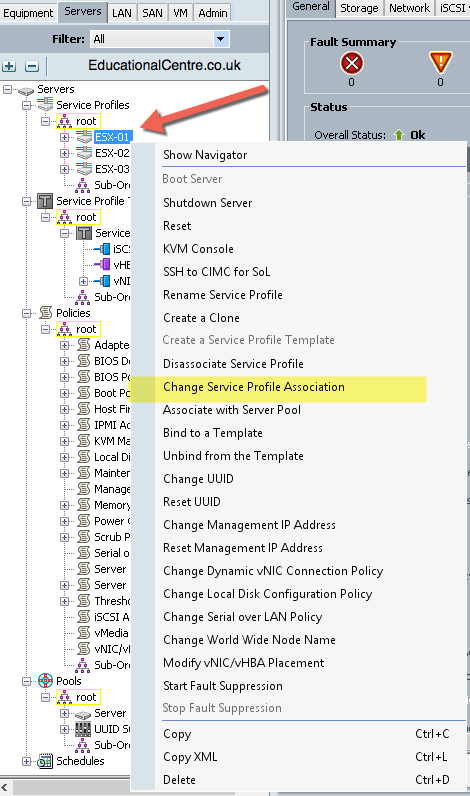 I have opted for creating a service profile per blade server as the environment is small, and any changes needed can be made to one blade server first and not affect the others. 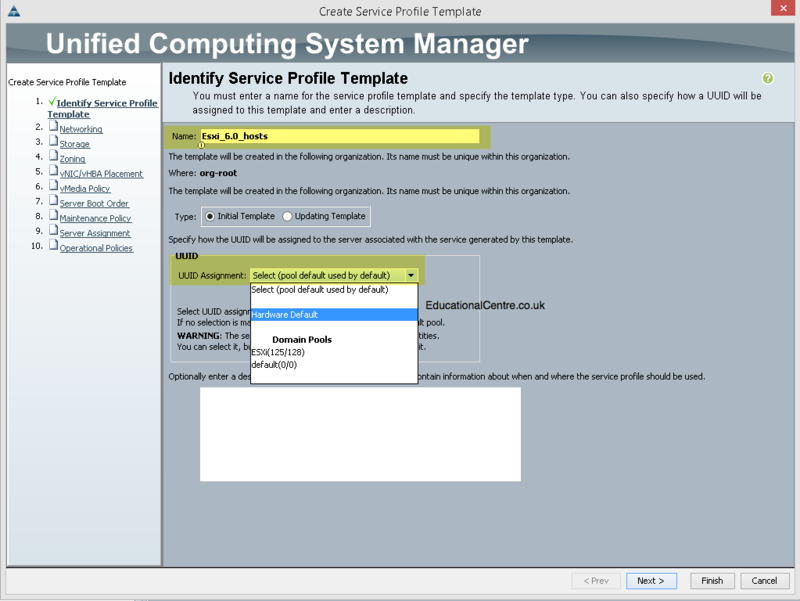 For larger solutions, you would have multiple servers assigned to one service profile. 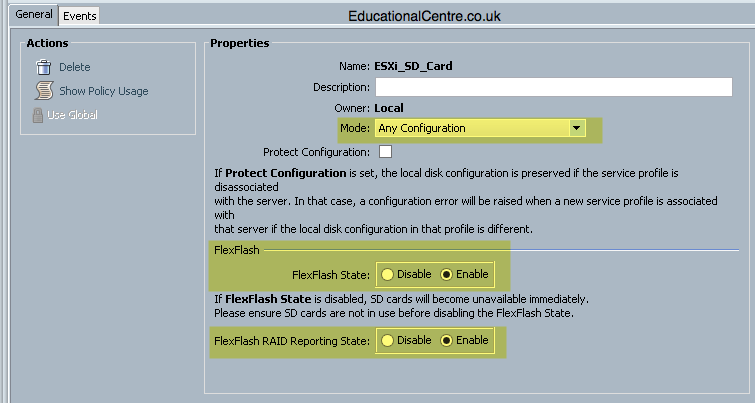 Head over to part 3, which covers configuring the SDCards for FlexFlash and deploying ESXi.